Most of us are familiar with heat waves on land, but in a warming world, heat waves are starting to become common in the ocean, too. 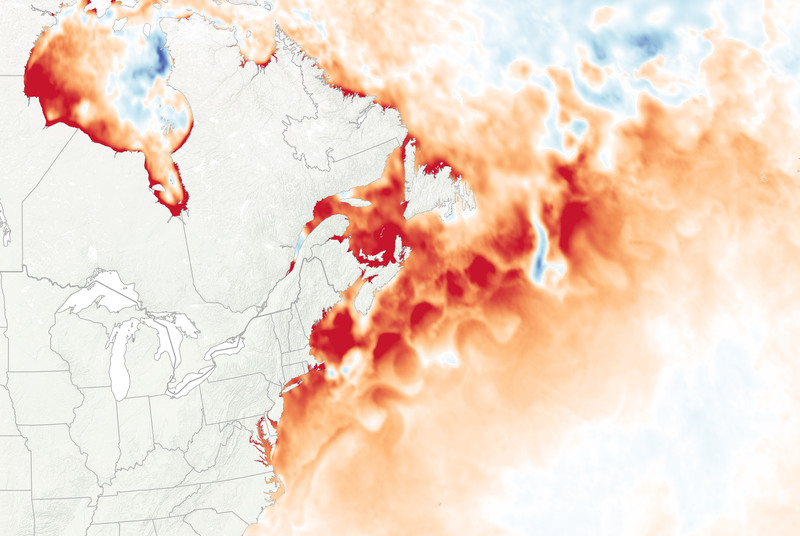 One basin in particular, the normally cool Gulf of Maine in the Northwest Atlantic Ocean, has seen several heat waves in recent years and has spent most of 2018 with unusually warm water temperatures. 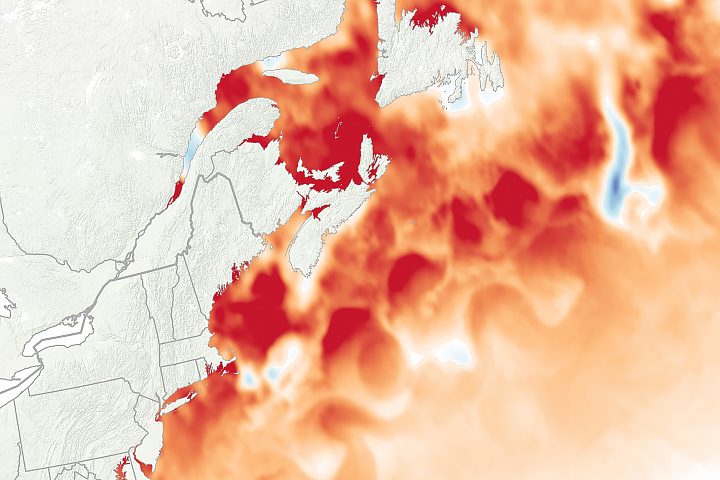 On August 8, 2018, scientists using satellite data and sea-based sensors measured the second warmest sea surface temperatures ever observed in the Gulf of Maine. Average water temperatures reached 20.52 degrees Celsius (68.93 degrees Fahrenheit) that day, just 0.03°C (0.05°F) below the record set in 2012. 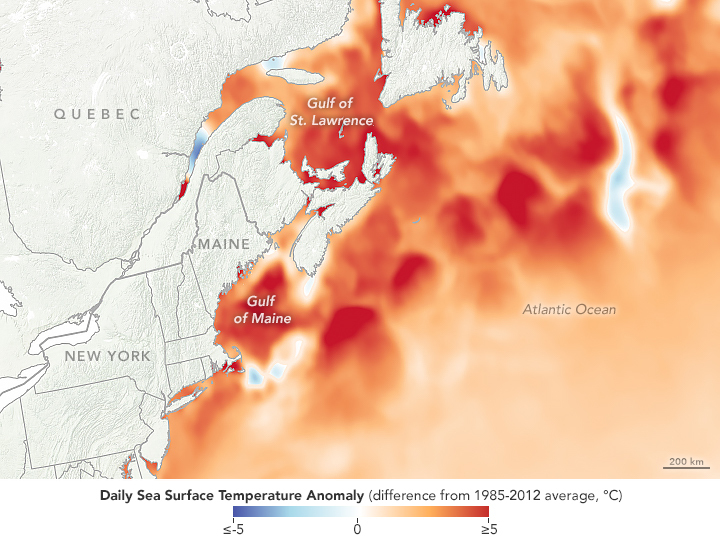 The maps on this page show sea surface temperature anomalies as compiled by NOAA’s Coral Reef Watch, which blends observations from the Suomi NPP, MTSAT, Meteosat, and GOES satellites and from computer models. Shades of red and blue indicate how much water temperatures were above or below the long-term average for the region. The map above shows conditions on August 8, the near-record setting day, while the map below shows conditions across the entire month of August 2018. The heatwave of 2018 fits with a much longer trend in the region, which is among the fastest-warming parts of the global ocean. 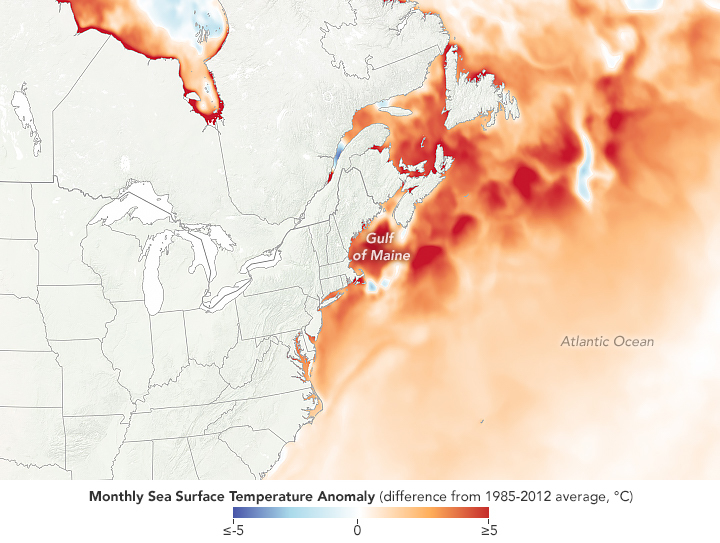 In the past three decades, the Gulf of Maine has warmed by 0.06°C (0.11°F) per year, three times faster than the global average. Over the past 15 years, the basin has warmed at seven times the global average. 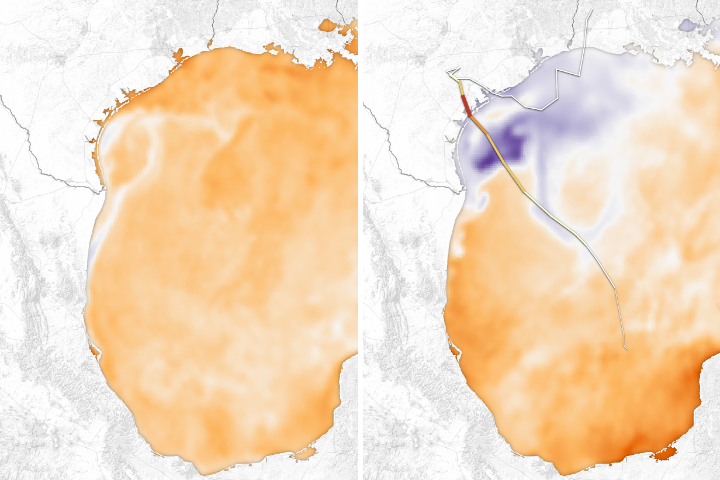 The Gulf has warmed faster than 99 percent of the global ocean. In recent years, oceanographers have come to define marine heatwaves as periods when water temperature rise above the 90th percentile (of average temperatures) for more than five days. 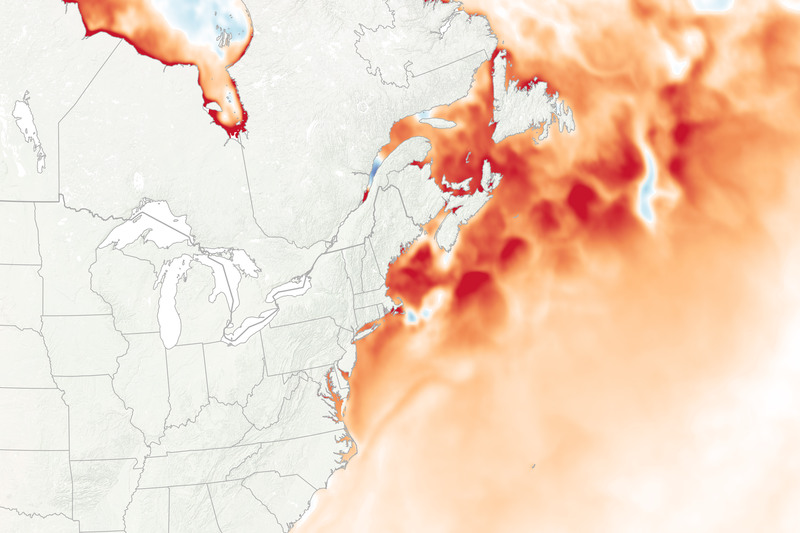 In 2018, the Gulf of Maine has spent more than 180 days above the 90th percentile. The Gulf of Maine stretches from Cape Cod to Nova Scotia, and it is key intersection between cold water masses from the Arctic and warm water masses from the Gulf Stream. The warming trend in this basin likely has two main causes. First is the overall warming of the global ocean as air temperatures and greenhouse gas concentrations rise. Second is the melting of ice in Greenland and the Arctic Ocean, which provides pulses of fresh water that can alter ocean circulation patterns in the region. The warming waters are already affecting marine species in the area, according to several news media and scientist accounts. Herring populations (based on fishing catches) seem to be down this year, and researchers and fishermen are seeing more species usually found in warmer waters, such as butterfish and squid. The populations of copepods, a key food source for endangered Northern Right Whales, also seem to be moving with the changing conditions. And puffins have had to adapt in feeding their chicks this year, as the newly common butterfish are too large for hatchlings to swallow. 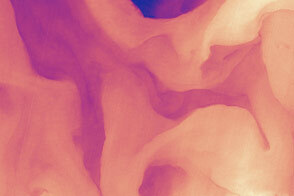 NASA Earth Observatory images by Lauren Dauphin, and sea surface temperature data from Coral Reef Watch. Story by Michael Carlowicz. Extreme water temperatures in 2018 fit with a much longer trend in the region, which is among the fastest-warming parts of the global ocean. 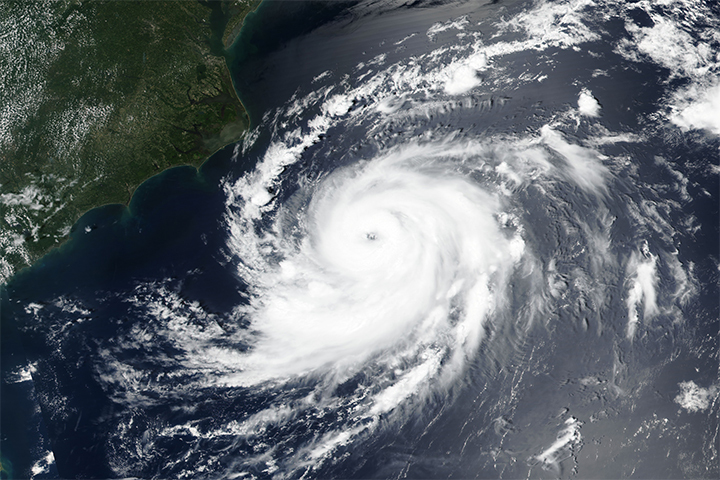 Tropical cyclones in the Atlantic most often develop during the ocean basin's official hurricane season from June 1 through November 30. Gulf of Maine Research Institute (2018, August 30) Amid “Ocean Heatwave,” Gulf of Maine Experiences Record Temperatures. Accessed September 10, 2018. Gulf of Maine Research Institute (2018, February 14) Gulf of Maine, Explained: The Warming Gulf of Maine. 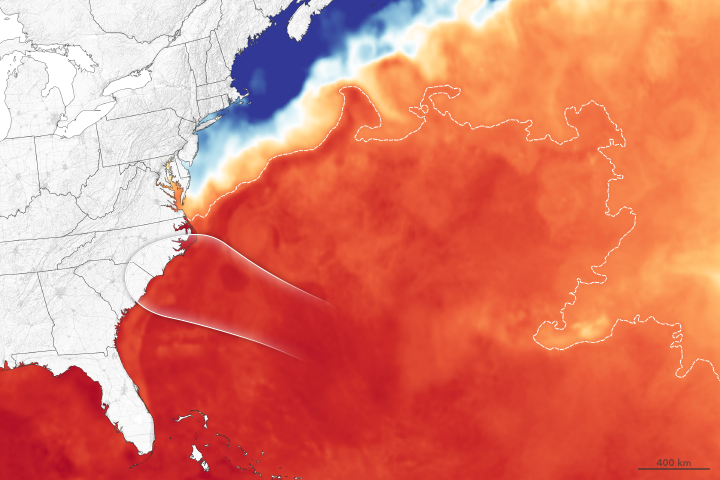 Accessed September 10, 2018.
ecoRI (2018, April 13) Ocean Temperature Off Northeast Coast Rising. 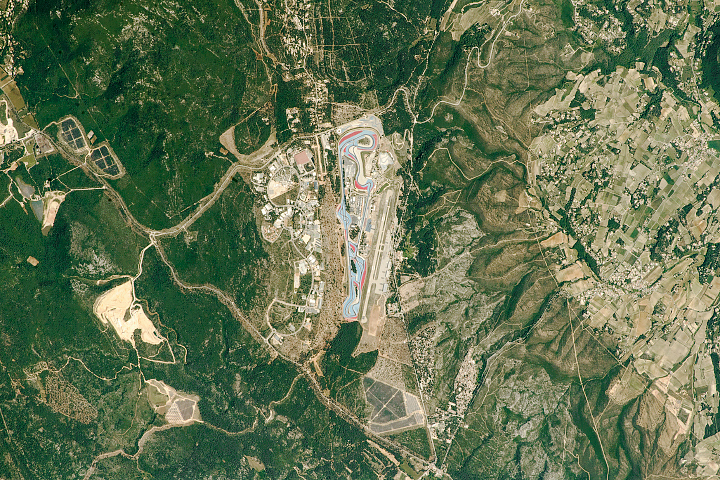 Accessed September 10, 2018. The Ellsworth American (2018, September 10) Gulf of Maine suffers an ocean “heat wave.” Accessed September 10, 2018. Maine Public (2018, August 31) Animals Are Trying to Adapt to The Gulf of Maine’s Marine “Heatwave.”. Accessed September 10, 2018. NOAA (2018, September 7) Warm Sea Surface Temperatures in the Western North Atlantic. Accessed September 10, 2018. The Press Herald (2018, April 24) Deep current of record-breaking warm water causes concerns for the Gulf of Maine. Accessed September 10, 2018. The Weather Channel (2018, September 5) Gulf of Maine Water Temperatures Soar Near Record Highs After Ocean “Heat Wave.”. Accessed September 10, 2018.